Digestive enzyme blend to aid digestion. Ever notice that some foods just don’t sit well? Almost everyone has a trigger food or an occasional bad digestion day, whether it’s an unsettled feeling after eating veggies, heaviness after downing a steak, or bloating that keeps you from buttoning your jeans. Proper digestion takes a precise concentration of balanced enzymes. A diet rich in fresh, uncooked foods helps supply these enzymes and ensure this balance. Unfortunately, fresh foods make up only part of some meals for most people. Cooked, processed, and over-ripened foods give you fewer digestive enzymes and decrease your ability to absorb nutrients from your food. This taxes the digestive system, making it work harder to compensate for the lack of natural enzymes. In addition, the physiological ability to produce enzymes that properly digest food tends to decrease with age. 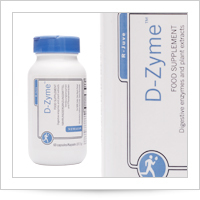 D-Zyme has been designed to provide a broad spectrum of digestive enzymes to supplement your diet. Glucoamylase - Supports proper digestion of starches, this enzyme specifically helps the conversion of starch to glucose. Invertase (sucrase) is used to convert sucrose to fructose and glucose. Protease is the principle enzyme used to breakdown proteins. Amylase—The principal enzyme in the mouth, naturally found in bananas, cabbage, corn, eggs, mushrooms, honey, rice, and wheat. Lipase used by the body to break down dietary fats into an absorbable form. Lactase is the enzyme in the small intestine that digests lactose (the naturally occurring sugar in milk). Phosphatase this enzyme assists in the digestion of phosphate groups in foods. Ginger rhizome (Zingiber officianales)—Contains substances similar to digestive enzymes and supports normal digestion. Fennel seed (Foeniculum vulgare) Used historically to provide support against effects from bulky fatty meals (wind heartburn). Capsicum (Capsicum annum) Cayenne pepper has a rich history as a spice for heat, flavour and to help digestion a perfect accompaniment to fennel and ginger. Take 1-2 capsules with each meal up to 6 capsules per day. Enzyme Blend: (Acid Stable Protease, Amylase, Cellulase, Glucoamylase, Invertase, Lactase, Lipase, Malt Diastase, Phosphotase, Hermicellulase, Beta Glucanase), Maltodextrin, Hydroxypropyl Methylcellulose, Bromelain, Papain, Plant Extract Blend [Ginger root (Zingiber officinale), Fennel seed (Foeniculum vulgare), Turmeric root (Curcuma longa), Capsicum fruit (Capsicum annuum)] Rice Flour.